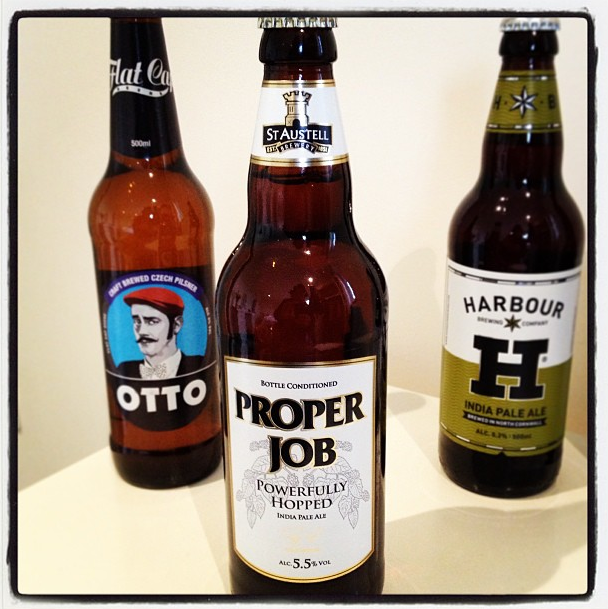 Proper Job is a really decent IPA – using some American Hops – it should by rights be a more American Style IPA – but seems to retain some English heritage and character. It has a lightly hazy copper colour with a medium creamy off-white head which it retains for a little while with good lacing. Aroma is cedar, herbal, citrusy and woody hops. Flavour-wise, it has a lovely clean biscuit and toasted maltiness to it – with hints of grapefruit. This is all followed by medium hoppiness and bitterness, offering a clean dry finish. First brewed in December 2005 for the St Austell Brewery Celtic Beer Festival, Proper Job is an authentic IPA brewed with Cornish spring water and malt made from a blend of malts including Cornish grown Maris Otter barley. A powerfully hopped golden bitter that explodes with citrus grapefruit flavours.